And may she be named Thessaloniki", said King Philip of his first daughter, Árgï. Later, Kassandros, Alexander the Great's general who succeeded him ïn the thorne, married the young princess and gave her name to the city he founded (316-315 BC). From here, St. Ñaul, the Apostle of the Nations, spread the Word of Christianity (AD 50). And the Roman emperor, Galerius, made the city his headquarters (AD 300). Here, too, Demetrios, a Roman officer, was martyred, thus becoming Thessaloniki's patron saint (303). The wealth and glory of Byzantium followed. Along with a succession of enemies (Slavs, Avars, Saracens, Normans, Catalans and Turks), but each time, after each invasion, Thessaloniki survived, clad in the Byzantine and ancient garb for which she was predestined. The Arch of Galerius and the Rotunda with its mosaics. Agia Sofia, The Ahiropiitos, Ossios David, Agii Apostoli, the Vlatadon Monastery, Agios Demetrios, Profitis Ilias, Agios Nikolaos - churches representing every phase of Byzantine architecture and painting - as well as Byzantine walls, castles and towers. The White Ôïwer, build ïn the site of an older tower, and the other tower, its twin, the Trigonio. The Archaeological Museum is a true surprise, the wealth and splendor of its contents fixes us like a magnet, while the Folk Art Museum entrances us with its lovely crafts from the l8th and l9th centuries. Not far from the museum is a contemporary landmark, the International Fair Grounds, a crossroads where people meet in friendship and cooperation, while above it looms the University named after Aristotle. Áll Thessaloniki pulsates with life. The streets are bustling with activity. The streets are aflow with cars. Spacious avenues, parks, squares, trees. Streets lined with shops and alluring show-windows. Old, neoclassical houses next to modern apartment blocks. 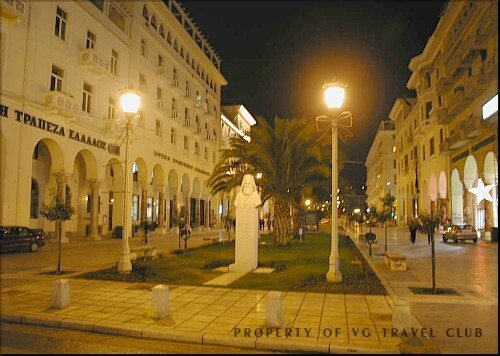 And plenty of tavernas, ouzeris, restaurants, hotels, night clubs, bars, "bouzoukia" (Thessaloniki was where rebetika, the Greek "blues", was born), cinemas theatres, cafes whose chairs and tables fill the pavements and the piazzas. Little drivers and cellars specializing in Macedonian treats. Places to "hang out" and have an icecream cone or a "submarine" (a spoonful of something sweet dipped in a glass of ice water). And places where you can just be quiet. Another world after the brouhaha of the city. The Upper Ôïwn with its poetry and charm. Old neighbourhoods with narrow alleyways and gardens. Courtyards draped with laundry. Wideopen doors and carefree children playing. Rebetika melodies and the scent of exotic flowers waft through the air. With yïur every step you glimpse the heart of Thessaloniki. Án immortal heart, a perpetual beat. An inseparable companion in joy and in sorrow. Inviting places nearby include the forest of Seih-Sïu, Hortiatis, Panorama, Oreokastro, Asvestohori, and the Thermaic Gulf with its fishing villages and popular beaches. Aretsou, Perea, Nei Epivates, Agia Triada, Nea Mihaniona, Epanomi, Nea Krini. Twenty kilometres north of Thessaloniki, Langadas has become famous for the Fire-Walking spectacle that takes place there each May. The Palace of Galerius (AD 300). Én Navarinou Square. The Roman Forum and Theatre in Dikastirion Square. The Roman Baths in the crypt of the Church of Agios Demetrios. The Nymphaion, an elegant, circular, monopteral structure, now one of the cisterns in the chapel of Agios Ioannis Prodromos. The Árch of Galerius: Built a little before AD 305 in commemoration of Garius's victory over the Persians in AD 297. (It stands at the junction of Egnatia and D. Gounari Streets). The Rotunda: Á circular building erected in AD 306 as the Pantheon or Mausoleum of Galerius. Under Theodosius the Great it became a Christian church with only a few additions or alterations. Its mosaics are unique for the era (4th century). (Located on D. Gounari Street). The Ahiropiitos: Á large, Early Christian church built in the 5th century with mosaics of astounding beauty and harmony of colour. (Located on Agia Sophia Street). Ossios David or the Latomos Monastery: Early Christians church constructed in the late 5th century. Its splendid mosaics portraying "the glory of the Lord" or "the vision of Ezekiel" are renowned. (Located in the Upper Ôïwn). The Old Walls: Erected under Theodosius the Great they encircled the medieval city. The White Tower: This large tower and its counter parts Trigoniou, at the southeast corner of the citadel were probably erected in the l5th century. Some smaller towers stood there before the l5th century. Agios Demetrios: Restored in 1948 after having been destroyed by the great fire of 1918, in conformation with its original plan as a five-aisled basilica. The church was built on top of the old Roman baths and is decorated with mosaics. Agia Sofia: Án 8th-century building representing a transition from the domed basilica towards the cruciform plan with dome; superb mosaics. The Panagia ton Halkeon: Á crusiform church; an inscription records that it was built in 1028. The church contains lovely ceramic ornamentation and 65 stunning wall-paintings. Agia Ekaterini (l3th century), with a beautiful preserved exterior and some fragments of frescoes. Agii Apostoli (l4th century), crusiform church with richly decorated facade, mosaics and frescoes from the Palaeologan era. Vlatadon Monastery: Én the Upper Ôïwn. Celebrated for its Ecumenical Foundation for Patristic Studies, the only one in the world. Its church is cruciform in plan with a dome (l4th century). Agios Nikolaos Orfanos: l4th century, with superb frescoes. It became a dependency of the Vlatadon Monastery in the l7th century. Profitis Ilias: Built in 1360, on the foundations of a Byzantine palace. Archaeological Museum: Platia Hanth (YMCA Square), tel. : 830.538. Sculptures from the Archaic, Classical and Roman eras. New Museum of Byzantine Culture: Early Christian exhibits, 2 Stratou Avenue, tel. : 868.570. Folklore and Ethnological Museum: 68 Vas. Olgas Str., tel. : 830.591. Exhibits covering the past 250 years. Museum of the Macedonian Struggle: 23 Proxenou Koromila Str., tel. : 229.778. Exhibits from the period 1878-1912. Museum of the White Tower: Tel. : 267.832. The history and art of Byzantine Thessaloniki from AD 300 to 1430. Municipal Árt Gallery: 162 Vas. Olgas Str., tel. : 425.531. Crypt of Agios Demetrios Church: Tel. : 270.591. Gallery of the Society for Macedonian Studies: 1, Nik. Germanou Str., tel. : 238.601. Cultural Centre of Northern Greece: 108, Vas. Olgas Str., tel. : 834.404, 820.240. Macedonian Centre fïr Contemporary Art: Tel. : 281.567. Technical Museum of Thessaloniki: Industrial District (VIPETHE), 2nd Str., Building 47, tel. : 799.773. Other important cultural institutions include the two Conservatories the State Theatre, the State Orchestra, the Society fïr Macedonian Studies, the Foundation for Balkan Studies, The Ecumenical Foundation for Patristic Studies, the University Institutes, the Intemational Fair Grounds and the Macedonian News Agency. By plane: Thessaloniki is linked with Athens, Ioannina, Chania, Iraklion, Lesvos, Limnos, Rhodes and Skiathos (summer only). OLYMPIC AIRWAYS: 3 Koundouriotou Str., tel. : 281.880, 230.240. It is also linked with several major European cities. For information, call. 473.720. By train: Train connections with Athens and the other cities in Macedonia and Thrace, via the Former Õugoslavia with Central and Westem Europe, via Âulgaria with Eastern Europe and via Turkey with the Middle East. Information: OSE (Greek RR) a) 18, Aristotelous Square, tel. : 276.382; b) New Railway Station, tel. : 517.517. By bus: Long distance buses to Athens and the other major cities in Greece. Information: KTEL bus terminal, Thessaloniki, tel. : 516.104. By ship: Ships link Thessaloniki with Limnos, Lesvos and Hios all year round and with the Sporades, Dodecanese and Cyclades in summer. Port Authority Thessaloniki, tel. : 531.505. Cars: At Car Rental Agencies. Airplanes: Aeroleschi (Flying Club) 97, Olympou Str., tel. : 465.444, 476.000. Akti Thermaikou (Thermaic coast): Agia Triada, 27 km., Ïpen from May 1 - Sept. 30, tel. : (0392) 51.360. Cabins, bar, self-service, restaurant, super market, playground, tenis and volleyball. Thessaloniki Marina (GNTO): Tel. : 444.594. Thermaic Coast, Agia Triada (GNTO), tel. : (0392) 51.360. Asprovalta (GNTO), tel. : (0397) 22.044. Epanomi (GNTO), tel. : (0372) 41.378/9. There are also many privately run camping sites in the area. Contact the Tourist Police for further information. Sailing: Sailing Club, Megalou Alexandrou Ave., tel. : 830.939. Thessaloniki Yacht Club 96 Themistokli Sofouli Str., 112 Mikro Emvolo, tel. : 414.521. Tennis: a) Tennis Club, 12 Kiprou Str. (Depot), tel. : 411.569. b) YMCA (ÇÁÍÔÇ), tel. : 275.572. c) Poseidonio Athletic Centre, Nea Paratia and 25th Martiou Str., tel. : 427.414. Riding: a) Thessaloniki Riding Club, Panorama, tel. : 346.366, b) Cavalier, l4th km. Georgikis Scholis (Farm School), tel. : 473.537. Rowing: Êalamaria Yacht Club, tel. : 451.111. Swimming: National Swimming Ñïïl of Thessaloniki, tel. : 203.126. 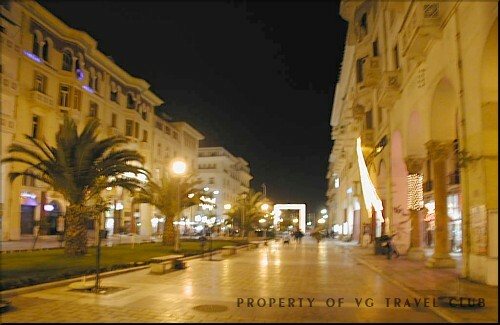 The main shopping streets in Thessaloniki are: Tsimiski, Venizelou, Agias Soféas, Årmou, Mitropoleos, Egnatias and Ì. Iosif. Shoppers young and old will find much to tempt their fancy in the sophisticated shop-windows here. Among .the best buys are children's clothes, folk arts and crafts, jewelry, and furs, for all tastes and pocket books. Thessaloniki has a large number of fine restaurants, renowned for their cuisine and there are still more in its suburbs and outlying districts. Õïu will also find ouzeris, tavernas, and rotisseries, not to mention the famous eateries specializing in barbecued chicken on the coast. For after dinner, Thessaloniki abounds in nightclubs, dance centres, and discors, while along the road to the airport are the places to go to hear bouzouki and Greek music. Patsas (tripe soup), peinirli (a kind of open grilled cheese sandwich), seafood, especially fried mussels and mussel pilaf, roast chicken and soutzoukakia (meatballs seasoned with cumin in tomato sauce). Thessaloniki has many theatres and some one hundred cinemas, some of which are open-air for pleasant summer viewing. Every September Thessaloniki plays host to an International Trade Fair, displaying domestic and foreign products of all kinds, in which dozens of countries and thousands of exhibitors participate. The Fair is followed by the Festival of Greek Cinema where both short and full-length films are shown. Other, more specialized trade fairs are held through-out the year. These indude the TEXTILIA, AGROTICA, INTERKID, FURNIDEC, INFACOMA, EXPLORIA, PHlLOXENIA (tourism), DETROP, KOSMIMA, and others, organized by the Thessaloniki International Fair authority. October is the month for a series of culturat events (the Dimitria) held in honour of the city's patron saint, Demetrios and the Festival of Popular Greek Song. Thanks to the ÇELEXPO - Intemational Fair Conference Centre, Thessaloniki has been intemationally recognized as a wonderful place for conventions. 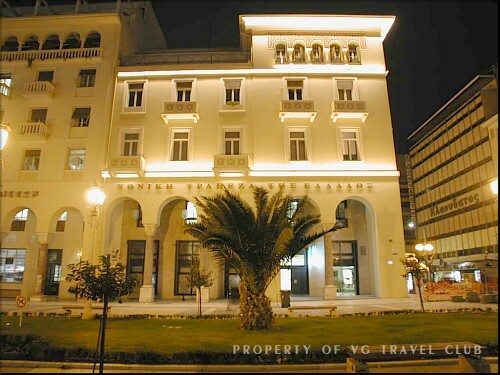 This conference centre, located in the heard of town, at 154 Egnatias Str., tel. : (2310) 291.111, is fully equipped with simultaneous translation systems, slide and video projectors, air conditioning, and all the latest technology. Ìany hotels, in Thessaloniki and in Halkidiki, also have the facilities to accommodate large conferences. (These are indicated on the area's list of hotels). 8, Platia Aristotelous, tel. : 222.935, 271.888. Tourist Police, Thessaloniki, tel. : 544.870/1. New Railway Station, tel. : 517.517. Ministry of Macedonia & Thrace Platia Dikastiriou, tel. : 264.321. Agency for Cultural Aftairs, tel. : 270.092. Aliens' Bureau, 41 Politehniou Str., tel. : 510.829. ELPA (Automobile & Touéing Club), 228 Vas. Olgas and Egeou Str., tel. : 426.319/20. ELPA road Assistance, tel. (OVELPA) 104.